Sick of the snow back east? Still trying to come up with a plan for New Year's Eve? Think sun and fun, Southern California-style. A number of our favorite hotels along the SoCal coast are offering incredible December deals. Some seem almost too good to be true, but we promise, they're not. Book any of those listed below through Elite Travel International and we'll make sure you have a holiday (and/or New Year's to remember!). 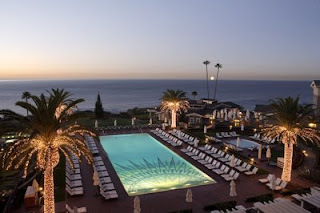 At Montage Laguna Beach (pictured), enjoy a New Year's Eve Extravaganza package that includes a three-night stay at the beachfront resort, daily breakfast for two, complimentary parking and two tickets to the hotel's swanky New Year's Eve Gala. Prices start at $2,009 for accommodations in a deluxe Horizon King. The Ritz-Carlton, Laguna Niguel offers a Bed and Breakfast package (applicable throughout the holiday season) priced from just $349/night inclusive of accommodations and full breakfast for two. A six-course gourmet New Year's Eve dinner with live music, dancing and festivities is offered for $275 per person. In Santa Monica, the oceanview Fairmont Miramar Hotel & Bungalows offers a great holiday rate of $319/night AND includes a $100 American Express gift card per stay which is perfect for those last-minute gifts (conveniently, the shops of the Third Street Promenade are just steps away!). For those who prefer to stay off the beach and closer to Beverly Hills, Luxe Hotel Sunset Boulevard (halfway between the two) is the perfect choice. With spacious suites and a soothing Zen-style decor, this pet-friendly property is truly a hidden gem. It's also the best deal in town with rates of just $209 through February for an oversized junior suite and a 10 percent discount at the beautiful On Sunset restaurant. Contact us today to find out more about these and other last-minute holiday deals!